ST. LOUIS, Mo. – GMC today announces the new 2011 Sierra Denali HD, the first offering of the exclusive Denali line on a heavy-duty GMC pickup. The Sierra Denali HD leads a comprehensively redesigned lineup of 2011 Sierra 2500HD and 3500HD trucks that go on sale in early summer – including the most powerful diesel engine in the segment. Sierra HD’s new 6.6L Duramax turbo diesel delivers 397 horsepower (296 kW) at 3,000 rpm and 765 lb.-ft. of torque (1,037 Nm) at 1,600 rpm. The Sierra Denali HD comes exclusively on the 2500HD chassis, in a 4WD crew cab standard box configuration. A Vortec 6.0L gas V-8/six-speed automatic powertrain is standard and the new Duramax 6.6L turbo diesel/Allison 1000 six-speed transmission powertrain is available. The iconic Denali four-bar, chrome grille with round air inlets distinguishes the Sierra Denali HD on the outside, along with body-color bumpers, chrome door handles, chrome accents and 18- and 20-inch polished forged aluminum wheels. Purposeful technology, including available mobile WiFi, USB connectivity, Bluetooth connectivity, XM Satellite Radio, OnStar 9.0 and navigation. Following are details of the new and redesigned product features of the Sierra Denali HD and the other Sierra 2500HD and 3500HD models. The Sierra HD lineup brings greater capability. Snow plow capability for all 4WD cab configurations. 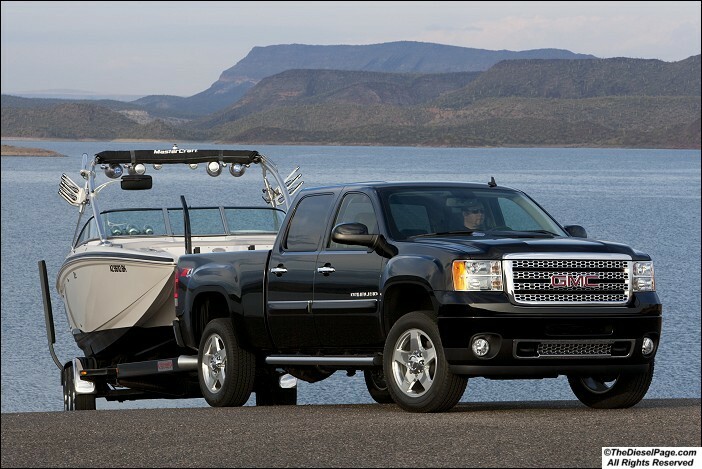 The new 2011 Sierra Denali pairs capability with premium features. The details: The new Sierra Denali HD is offered exclusively in the Crew Cab standard box configuration on the 2500HD chassis, providing a spacious cabin with room for up to five. As with other Denali models, including the new Acadia Denali, the cabin is unique with standard premium touches. It includes Denali-specific brushed aluminum trim, power-adjustable pedals, a Bose premium surround audio system and 12-way power seats. Along with an optional heated steering wheel, heated and cooled leather-appointed seating is available. The exterior is offered in three colors: Black, Stealth Gray and White. On the capability front, the Sierra Denali has a gross vehicle weight rating (GVWR) of 10,000 pounds (4,536 kg), a payload capacity of 2,959 pounds (1,342 kg) and a maximum trailering rating of 15,600 pounds (7,076 kg) with a fifth-wheel hitch. The maximum conventional hitch trailering rating is 13,000 pounds (5,897 kg). Engineers developed 11 all-new, fully boxed frame assemblies to improve durability and ride characteristics and support increased capabilities. The details: The frames have increased cross sections and use more high-strength steel for greater durability, higher towing capacity and improved ride and handling; the front sections are hydroformed. The bending and beaming stiffness of the frames is increased 92 percent and 20 percent, respectively, with the fully boxed sections enhancing torsional stiffness by a factor of five. Also, larger engine and transmission mounts, coupled with a 125-percent-stiffer front frame structure, provide greater vibration control, while hydraulic body mounts are incorporated under the cab section on extended and crew cab models for a more isolated feel inside. Engineers addressed common customer and aftermarket uses when designing the new frames, including adding access holes to the rear frame section to enable easier installation of fifth-wheel/gooseneck-style hitches. Also, the frame-mounted hitch for conventional trailering is stronger, with a box-tube design. It supports up to 16,000 pounds (7,257 kg). Sierra HDs feature a new, stronger independent front suspension – enabling snow plow installation on all 4WD models. The details: A completely redesigned independent front suspension system offers up to a 25-percent greater front axle weight rating – up to 6,000 pounds (2,721 kg) front gross axle weight rating (FGAWR) – so a snow plow can be used on all 4WD cab configurations with the available snow plow prep package. Sierra’s signature short-long arm/torsion bar front suspension design is retained, but now features new, forged steel upper control arms that are stronger and lighter than their predecessors. The new lower control arms are made of precision-machined cast iron to handle the greater loads. Five different torsion bar rates support five different front gross axle weight ratings (a single torsion bar was previously used for all models). This helps stabilize the range of trim heights of various models under load, while enhancing appearance, handling, durability, tire wear and alignment. The trim height is adjusted on each bar via a single bolt, easily allowing the height to be changed to account for the weight of a snow plow or other accessories. The Sierra HD front suspension now uses a pair of urethane jounce bumpers on each side, instead of one, for improved load management; and there’s a new upper shock mount attachment design that’s positively connected to the frame with two fasteners. This design eliminates squeaks and clunks, while supporting higher load capability and increased durability. COMPETITIVE FACTS: Compared to competitors’ beam-axle front suspensions, the Sierra’s independent front suspension provides a better ride, more accurate trim height control (with fewer parts) and greater flexibility to adjust the alignment for weight and tire sensitivity. A new asymmetrical leaf-spring rear suspension supports greater loads. The details: Matching the Sierra HD’s greater strength and capability is a rear suspension designed to support greater loads. It features a new, larger asymmetrical leaf-spring design that also contributes to improved ride and handling characteristics. The asymmetrical design is derived from unequal front and rear spring half lengths, which minimize axle hop and enhance traction control efficiency. 2500HD models feature a two-stage leaf-spring design, while 3500HD models have a three-stage design. All models feature 3-inch-wide (76 mm) leaf springs that are 20-percent wider than previous models. The larger leaf-spring design supports increased rear gross axle weight ratings across the board. On the 2500HD models, the rating is 6,200 pounds (2,818 kg) – up from 6,084 (2,765). On 3500HD models, the rating increases to 7,050 pounds (3,204 kg) on single-rear-wheel models and 9,375 pounds (4,261 kg) on dual-rear-wheel models – the latter representing a nearly 14-percent increase over the previous 8,200-pound (3,727 kg) rating. Sierra HDs deliver a more refined driving experience, with more capable ride, handling and steering. The details: Longer wheelbases – ranging from 133.6 inches (3,395 mm) to 167.7 inches (4,259 mm) – and wider front/rear tracks enhance the ride and handling characteristics of the Sierra 2500HD and 3500HD, giving them a greater feeling of smoothness and control. The longer wheelbases and wider tracks are complemented by the new, stiffer frames, new jounce bumpers, shock mounts and hydraulic body mounts to provide a solid, smooth and isolated driving experience. New shocks were specially valved to support the new trucks’ weight ratings, while balancing excellent ride characteristics. Also enhancing the driving experience is a revised steering system designed to support the trucks’ greater front gross axle weight rating. It includes a new, larger steering gear, power steering pumps and linkages. The pumps (different parts for gas and diesel models) deliver greater pressure for reduced steering effort in low-speed and parking maneuvers; they are also quieter. On some models, the new linkages feature a compliant joint added at the pitman attachment to enhance handling. The new 6.6L Duramax turbo diesel delivers segment-leading torque and up to 63-percent lower NOx emissions; and is B20-capable. Internal revisions that improve durability. An EGR cooler bypass reduces high-mileage soot deposits in the cooler and EGR circuit. COMPETITIVE FACTS: Compared with Ford Super Duty’s urea-based system, Sierra HD’s selective catalytic reduction after-treatment system delivers better overall diesel performance, with a range of about 5,000 miles (8,000 km) between DEF refills. Its optimized combustion and after-treatment process provides about 700 miles (1,125 km) between diesel particulate filter regenerations – a better capability than Ford’s. New Allison 1000 six-speed automatic transmission works with the Duramax 6.6L to deliver greater fuel economy, quicker acceleration, greater towing capability and exhaust brake system. The details: The enhanced Allison 1000 is strengthened to handle the higher torque capability of the new 6.6L Duramax engine, while also helping to improve fuel economy and provide seamless assistance with a new exhaust brake system. Greater efficiency is delivered through reduced “spin loss” – meaning, the transmission channels more of the engine’s power to the axles, allowing it to do more with less fuel. The Allison 1000 also features driver shift control with tap up/tap down shifting and a patented elevated idle mode cab warm-up feature. Also, the tow/haul mode reduces shift cycling for better control and improved cooling when towing or hauling heavy loads. The six-speed configuration retains its two overdrive gears for optimal efficiency. Performance with the Duramax/Allison combination is also improved over previous models, with preliminary testing showing 0-60 mph times of less than 9 seconds and quarter-mile times of less than 16 seconds in 2500HD models. That’s about 0.3-second and 0.5-second quicker, respectively, than previous models. A strengthened Vortec 6.0L/Hydra-Matic 6L90 six-speed powertrain is standard in all models. The details: The Vortec 6.0L gas V-8 with variable valve timing returns to the new Sierra HDs, along with a strengthened version of the Hydra-Matic 6L90 six-speed automatic transmission. This combination delivers excellent performance and efficiency, with a greater emphasis on low-rpm power. It is enhanced for 2011 with greater idle refinement. The engine is rated at 360 horsepower (268 kW) at 5,400 rpm and 380 lb.-ft. (515 Nm) at 4,200 rpm in trucks with GVWRs up to 10,000 pounds. It is rated at an estimated 322 horsepower (240 kW) at 4,400 rpm and 380 lb.-ft. of torque (515 Nm) at 4,200 rpm in trucks with GVWRs greater than 10,000 pounds. Adding a new heat shield and vent hose. COMPETITIVE FACTS: Ford’s new Super Duty models share the same transmission between their gas and diesel engines. Sierra HDs’ Allison 1000 and Hydra-Matic 6L90 transmission were developed for the specific horsepower, torque and operating range differences that distinguish the diesel and gas engines. Brake feel and performance is greatly improved. The details: The standard four-wheel disc system is completely revamped to deliver smoother, more immediate and confident-feeling performance. Four-wheel, four-channel ABS is standard on all single-rear-wheel models and a three-channel system is standard on dual-rear-wheel models. The front and rear rotors are larger in diameter – 14 inches (355 mm) – and width on all models to support their increased capacity, weight ratings and trailering ratings, while the calipers are stiffer and stronger. The hydroboost brake booster calibration is revised for reduced pedal effort, and the travel of the pedal is also revised for a more comfortable, confident feel. Larger wheel hub and bearing assemblies complement the new brake system, and the rear rotors attach to the wheel hubs for easier servicing. Sierra HD’s ‘smart’ exhaust brake feature provides greater control and reduces brake pad wear. The details: A new standard feature on Duramax-equipped models is the “smart” exhaust brake. This driver-selectable feature uses the turbine control of the variable geometry turbocharger and the compression of the engine to generate backpressure, slowing the vehicle without applying the brakes. It is integrated with the cruise control feature and varies the braking to account for the grade and vehicle load. The exhaust brake allows for virtually effortless driving and towing, with seamless and quiet operation. It also helps prolong brake life and prevents overheating the brakes on long, downhill grades. Comprehensive safety features and functional technologies include trailer sway control system and hill start assist. The trailer sway control system provides an added measure of confidence when towing a trailer. The system senses conditions of trailer sway and intervenes with braking and/or reduced engine power to bring the trailer under control and keep it on its intended path. The system uses electric trailer brakes when a trailer is plugged into the standard wiring harness of the truck and its performance requires no input from the driver. The hill start assist system is automatically engaged when sensors detect the vehicle is on a grade of about 5 percent or greater. It holds the brakes for about 1.5 seconds or until the gas pedal is pressed, preventing rollback – it is particularly effective when towing, giving the driver time to switch from the brake pedal to the gas pedal without rolling. The GMC Sierra HD lineup is broader than ever. The details: For 2011, the Sierra heavy-duty lineup expands to include 11 2500HD models and eight single- and dual-rear-wheel 3500HD models – including a new 3500HD Crew Cab with a 6.5-foot cargo box. Other models are offered in WT, SLE and SLT trim levels, while popular features such as the EZ Lift tailgate and rearview camera system are retained. Sierra HD professional-grade interiors are refined and well-appointed – and ready to work. The details: From the available remote starting feature to the unimpeded access offered by the 170-degree-opening rear access doors on extended cab models, the 2011 Sierra HD models reflect the professional grade blend of refinement and functionality for which GMC is known. The interiors have excellent attention to detail and are quieter – thanks to the range of the truck's enhancements. The stronger chassis, quieter Duramax engine and even details like a quieter power steering pump contribute to the Sierra HD delivering exceptional quietness. Along with quietness, Sierra HD models are designed for work. The interiors feature numerous storage compartments, providing covered access for everything from work gloves to laptops. For those who use their truck as a mobile office, Sierra HDs deliver with available mobile WiFi, USB connectivity, Bluetooth connectivity, XM Satellite Radio and a navigation system. Multiple charge points enable multiple electronic devices to operate simultaneously; and when equipped with the available navigation system, XM NavTraffic offers real-time updates of traffic conditions (in selected areas) that can help plan the most effective route to the job site. Sierra HDs are ready for the long haul – and the cold. The details: The 2011 Sierra HDs drive farther without stopping to refuel. A new, 36-gallon (136 L) fuel tank is standard on all models and, with the improved fuel efficiency of the powertrains, enables a cruising range of about 680 miles (1,090 km) with the Duramax 6.6L. Cold-weather customers will appreciate the Duramax 6.6L’s quick, reliable start-up, with a starting time on par with gas engines. Its glow plug cycle time is the segment’s best in all temperatures, taking no more than 3 seconds in temperatures as low as -20 F (-29 C). There’s also a cab heat-up feature that allows the engine to idle faster in low temperatures to warm the interior more quickly. The 2011 Sierra HD lineup has the best warranty coverage in America. The details: All 2011 Sierra 2500HD and 3500HD trucks work under the best warranty coverage in America: a five-year/100,000-mile limited powertrain warranty, plus roadside assistance, courtesy transportation and other features that provide assurance that GMC backs its trucks for everything the road offers. GMC is evolving to include more fuel-efficient trucks and crossovers. The GMC Terrain is a smaller SUV that offers 32 mpg highway fuel economy along with the capability, engineering expertise and refinement that have defined GMC for more than a century. Complementing the Terrain are the Acadia eight-passenger crossover, Yukon and Yukon XL and Sierra pickups. Today GMC is the only manufacturer offering three full-size hybrid models. Details on all GMC models are available at www.gmc.com. I was in St Louis on 3/11 and attended the work truck show, GM had their 2011 Denali 2500 on display. It was very impressive. GM also had a display with the new 2011 frame next to the old frame to show the improvements made along with GM engineers and maintenance engineers available to explain the changes made to the new model. They were also helpful and informative in discussing previous year models, maintenance issues, and generally all questions regarding Duramax engines, Allison transmissions etc. As an FYI, I wanted to pass along a piece of news announced today from GMC. The new 2011 GMC Sierra heavy-duty pickups have increased towing and payload ratings through ongoing development and testing, making them the most capable and powerful heavy-duty pickups in the segment. The ratings have been increased to 21,700 pounds of towing and 6,635 pounds of payload. It's nice to see that GM has rebuilt the Trucks, BUT how well have thy been tested. It sounds like its to good to be true. I remember when I was looking to buy a truck in 2005. I did a lot of reading and research, internet, Trailer Life etc. Everyone was saying how Great the Ford F-350 with the 6.0 was. I got the F350 and now 5 years later, I have a truck that only gets 6.6 mpg towing my 5th wheel. And it only has 80k on it. Now one year from retirement I will be forced to buy another truck. I hope GM won't be like FORD.